As Mr. Scrummy and I are planning a trip up to the beautiful ancient city of York this weekend to see a good friend, we were discussing the journey with my parents yesterday. Go this way, not that way, they advised us. And if you want to get there at this time then set out at that time – or perhaps a bit earlier so you can stop half way for a coffee break. ‘A coffee break?’ Mr. Scrummy scoffed. ‘But it’s only a 2 hour journey!’ He proceeded to pretty much fall about laughing. Well, you know, he’s from Australia where a long journey means 2 days across a scorching, tree-less never ending road. Here in the UK, ridiculous or not, many if not most of us treat stopping off for a drink on the motorway as part of the excitement of a trip. Yes, even just a 2-hour trip. But I can’t be too miffed with Mr. Scrummy’s scoffing because I too did some scoffing of my own while we were in Australia a few months back … over weather-related things. He and others would declare that it was ‘absolutely freezing outside’ when in fact it was … ooh, let’s say 12 degrees centigrade. Hmmm. My turn to fall about laughing. Just this evening I was walking back from the shops and it was sleeting with a biting cold wind. That felt absolutely freezing to me, and yet if I harped on about it in front of a Canadian, let’s say (hi, Canadian friends!) I’m sure I too would get laughed out of the room. Obviously these kinds of things can be very relative! There are several winner qualities to this dish. Number one: it’s super quick and easy with only a few ingredients. Number two: it’s really saucy, which for me often equals perfect comfort food. 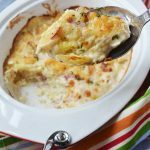 Number three: it’s a one-pan dish (well, if you don’t count the pasta pan …) and number four: it’s creamy and cheesy. Nuff said? This is insanely easy to throw together. Just throw your garlic, chorizo and cherry tomatoes into a bit of sizzling butter and let the tomatoes cook down for ten minutes until you can squish it into a sort of sauce, then add a bit of passata, cream, parmesan and basil. Dump in your cooked pasta and toss everything together, loosening the dish up with a bit of the pasta cooking water if you feel it needs it. Serve with a bit more parmesan and fresh basil to taste and you’ve got a super simple, comforting pasta perfection. The last thing I’d like to say about this quick pasta dish is that you can adjust the amounts of cream, tomato and parmesan added. If you don’t like your pasta sauces to be too creamy just add a splash of cream. If cheese takes you to cheesy heaven then go ahead and dump in another handful of parmesan. It’s totally up to you! So what do you think about my plans to stop for coffee on a 2-hour drive? Ridiculous or perfectly acceptable? 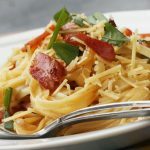 This tagliatelle with cherry tomato, chorizo and cream sauce is perfect for those busy days when you want to whip up something tasty and comforting really quickly. 1 handful parmesan cheese grated, plus extra to taste! Put a pot of water on to boil ready for the pasta. Melt the butter in a pan, then add the garlic and tomtoes and let cook on a medium heat until the tomatoes begin to soften. Squash them into the pan a bit so that they begin to form a sauce (about 10 minutes or so). Then add the chorizo to the pan and let cook for a minute or two. Add the pasta to the boiling water and cook according to the instructions on the packet. Meanwhile, add the passata and cream to the pan (add the cream to taste – the sauce should be a deep orangey red colour) and let bubble away for a few minutes while the pasta is cooking so that it reduces a bit. Then add most of the parmesan and stir through most of the basil. Drain the pasta when cooked, reserving a little of the cooking water, then add it to the pan and mix it into the sauce really well. Add a little of the cooking water to loosen up the sauce if you think it’s necessary. Serve the pasta. Sprinkle with the remaining parmesan and fresh basil. Eat immediately! Completely acceptable to stop for a beverage on such a trip. I like to think it is a nice way to break up a drive 😀 This dish looks delicious! I’ve never had chorizo before, but it sounds really fantastic in this meal. Plus a cream sauce and pasta always makes me happy. Hi, Cindy! 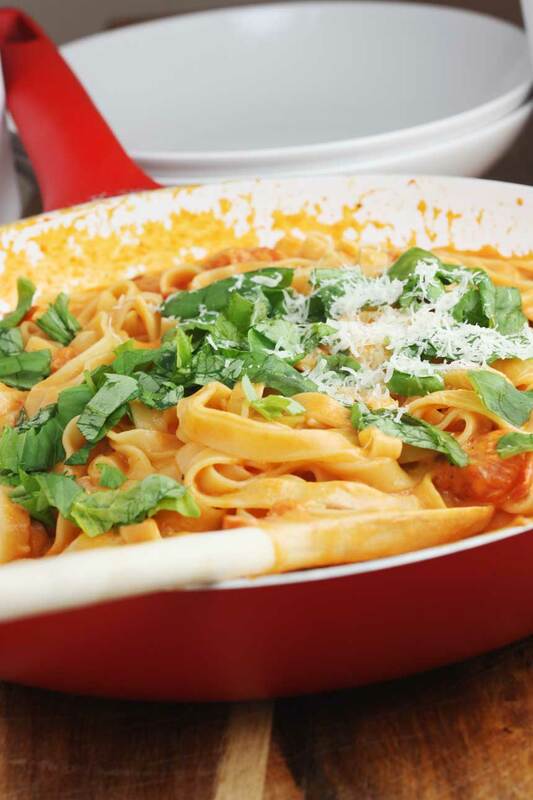 I agree that you can’t really go wrong with cream in a pasta sauce – especially in winter. Do try chorizo some time – if you can’t find it you could just add a nice sausage, though, and that would be tasty, too! My idea of freezing here in CA would be majorly scoffed at by most. I’ll keep it to myself. 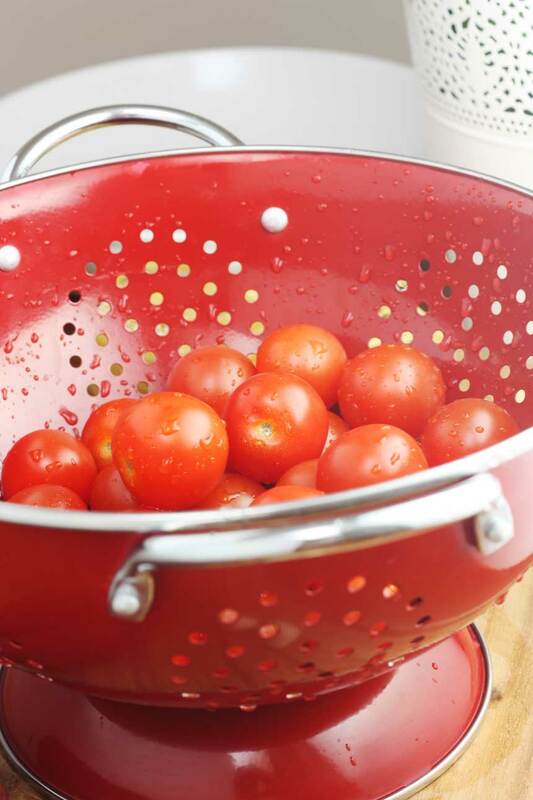 These cherry tomatoes are so perfect for this pasta, I just love this combination! Hi, Ilona … thank you! So glad you like it! 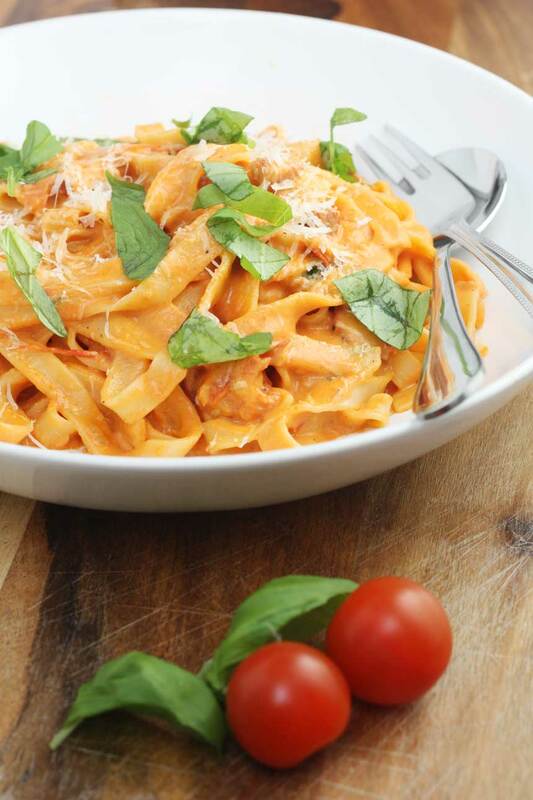 Wow Helen, these Tagliatelle look amazing! Love how quick and easy the recipe is! Enjoy your trip! I’ll stay here and drool over your yummy, creamy pasta dish! HAHAHA … thanks, Liz! Hope you enjoy your weekend, too! I hope you have a wonderful trip, Helen! This pasta looks amazing! I can never resist a dish like this. I love the chorizo in here! I don’t think I’ve ever had that in pasta before, so I must try this asap. Love it! Yummy, this looks like a lovely creamy comforting bowl of pasta. I bet the chorizo add so much flavor. Think I’ll be making this soon. Have a fantastic trip Helen! This looks like a stunning pasta dish!! Have fun on your (short) trip Helen! This absolutely is the type of pasta I love! 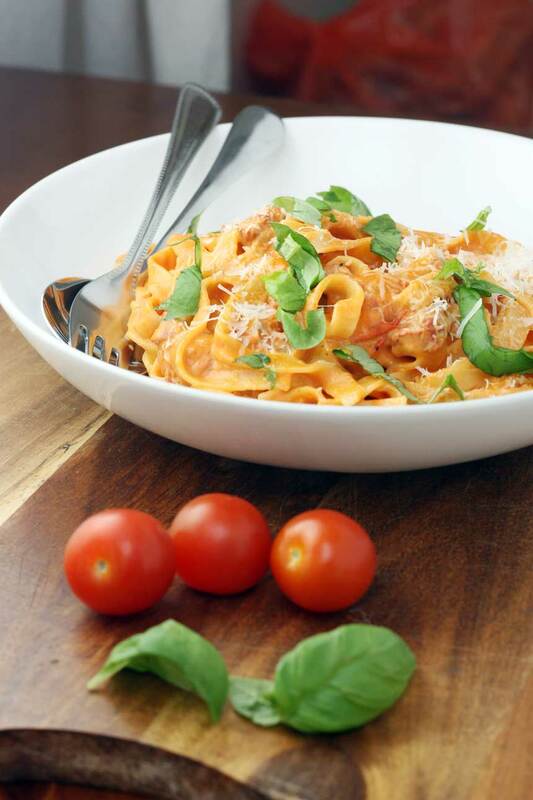 Glad you used tagliatelle and the addition of chorizo, too! Will try it soon! I’m sure we are going to like it! Haha … thanks, Mira! I’m sure you will like this if you try it. 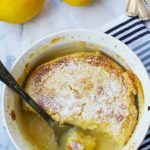 It’s sooo perfect for a mid-week winter meal! I guess it is somewhat summery! But at the same time – total comfort food! Thanks, Mariana! I always do find it funny to hear people complain about the weather. It is totally subjective! This pasta sauce though – unquestionably awesome. I love cream sauces on pasta, but they always look so heavy. This dish looks light and vibrant – I love the colors! I hope you have a wonderful trip! Thanks, Kathleen! The best thing is that you can up the cream or lower the amount and that’s just fine. It’s a shame that we can’t easily find decent chorizo here. I used to make chorizo at home but they tasted different. This dish is so beautiful and no need to say I’ll finish a big bowl of it! Maybe two. Btw, coffee break in a two hours trip? Totally need it! Maggie, you could easily use any good quality sausage in this dish … or even bacon to be honest. Or even without the meat altogether! I’m insanely jealous of your little trip to York, nothing like jolly old England at Christmas. Take a few pics for us =) I obviously love the cherry tomatoes and basil in this cheesy luscious dish. It’s freezing here today Helen and my furnace is acting up, I simply need this comfort food! Ooh Laura, you just have to visit England some day – and if you do, York should be at the top of your list of places to visit. I was being a bit lazy and didn’t take any piccies, but just google York and you’ll see how beautiful it is! Happy you like this tomato-ey, cheesy dish. You’re right that it’s great comfort food – but without being too unhealthy! My husband and yours would get along quite well! He is American but a maniac when it comes to driving. He drove cross country here in the US many times to school and back by himself in 3 days (ordinarily it takes 5 at least). He thinks nothing of it! 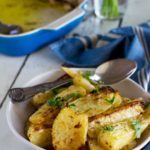 Loving this recipe – quick and yummy and I am just craving basil lately – those herbs are packed with nutrients too! I just can’t imagine driving for 3 days solid – let alone 5! I am a terrible driving wimp and would be stopping every couple of hours for sure! 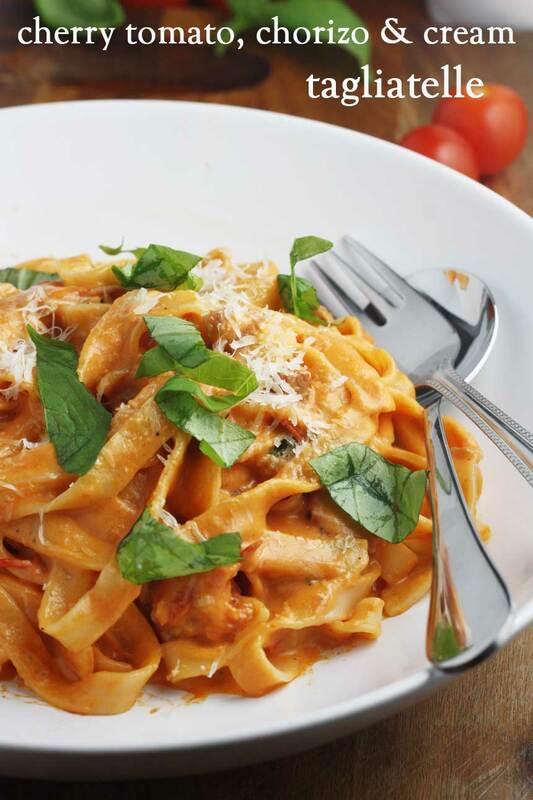 So glad you like this recipe … and thanks for the reminder about the healthy qualities of basil. I’m going to add some basil to tonight’s dinner too, now! 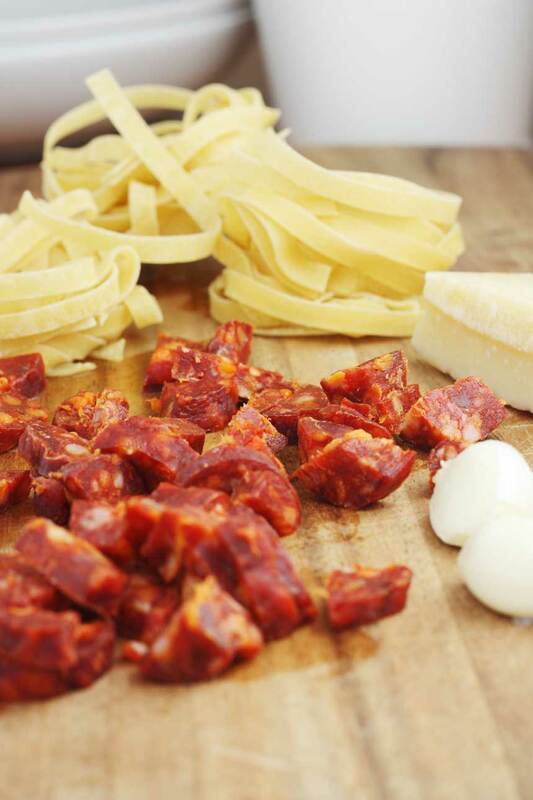 I love chorizo in pasta dishes, it just adds so much flavour. Thanks, Dannii … the trip was fantastic! I love everything about this dish, Helen! 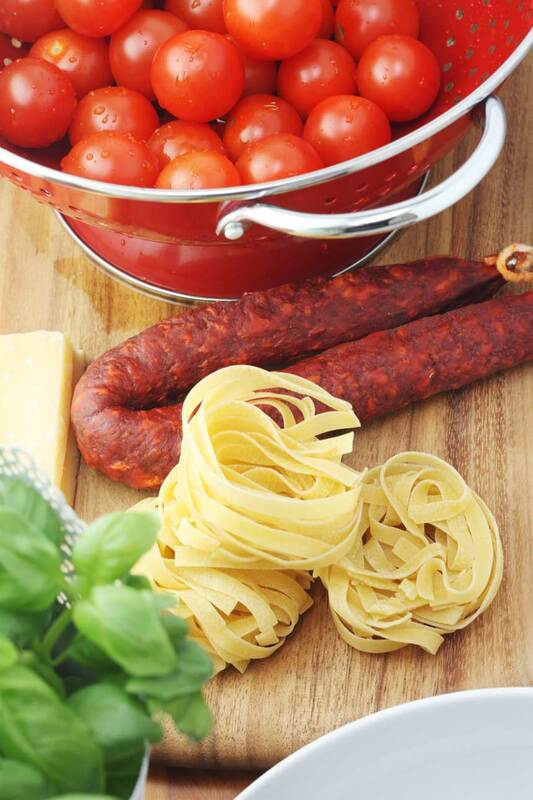 It’s combines all my most favourite flavours, the chorizo with the sweet cherry tomatoes sound amazing with the tagliatelle! Helen, this is gorgeous! Such a beautiful bowl of comfort right there! Man I’m totally craving pasta for dinner now! Well, very happy I did that to you, Chris!! 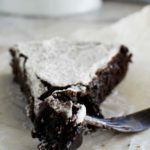 As I am very much into comfort food these days, this will definitely be added to my list! This looks scrumptious!! Pinned! Hi, Annie! Thanks so much for the pin … glad you like it! I have a theory that chorizo can take anything from here (hand at knee height) to here (hand above head!). This looks perfectly saucy. It’s still brekki time here but I really could do with a dish of this right now! You struck the right cord in me, my mouth watered as soon as I saw this!! You had me at chorizo, then creamy sauce, then pasta and I wish I had a bowl of this pasta right now. lol … happy I reeled you in so easily, Kathy! This looks amazingly decadent and creamy. I love the addition of spicy chorizo! Je crois que je suis comme les anglais! Même si la route est court, j’aime bien m’arrêter prendre quelque chose mais avec mon mari, c’est mission impossible ! Ton plat est irrésistible, j’aime beaucoup ces types des plats, simples, rapides et très bons ! It is great being able to create a warm comforting dish from such simple ingredients right? Sure is, Bintu! Thanks for passing by! 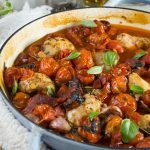 Hi Helen, I love driving in the rain and I love chorizo, what a great recipe, looks perfect for the cold weather. Really? Oh, I so hate driving in the rain or in the dark. So you can come on a rainy trip with me any time! Having a couple of workmates over on the weekend and this dish looks absolutely perfect! 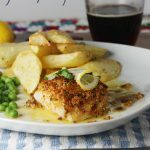 Your recipes are wonderfully flavoursome and so easy to put together. I love it when great meals are stress- free!. Now l’ve seen this, l can relax and enjoy their company without worrying about the meal. Hi Claire – this message has really made my day! Thank you so much! 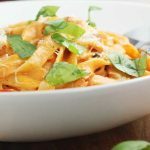 Other similar quick and easy alternatives are my chicken with pesto parmesan sauce (a more recent recipe, also good with pasta), creamy chicken and mushroom pappardelle, and baked lemon chicken with yoghurt sauce (also great with pasta!). What is passata? I dont know if we have that in the states! Oh sorry, Melissa, I didn’t know passata wasn’t ‘a thing’ in the US! It’s just like blended crushed tomatoes really, so you could run some crushed tomatoes through your food processor as a substitute! I came across this recipe on Pinterest today and the other half insisted that I make it…… I tweaked it just a little for us (added onion, mushrooms and asparagus) and left out the sugar as it had such an amazing flavour already. Hubby went back for seconds and has declared that it’s to be added to the recipe book. Hi Tara. Thank you so much for taking the trouble to leave your feedback. 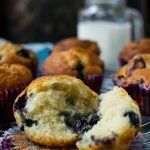 This is one of my older recipes, but really good to hear it’s still popping up on Pinterest! I’m so glad you enjoyed it! You might like to check out my other tomato/chorizo recipes. There’s one with chicken that we make all the time mid week. Very easy and delicious! Hi, you didn’t say when to add the passata? Oh sorry Veronica – you’re right! Add it just after adding the chorizo and letting it cook for a minute or two, at the same time as the cream. I’ll change the recipe!